The last part of the book to be made was the cover; an earlier attempt in the summer had been aborted by a pair of Wellington boots tromping over aquamarine silkscreens aerating on the kitchen linoleum. The muddy heel prints were viewed momentarily as a sort of enhancement — perhaps even an appropriate reference to tactics of the local constabulary — before being pitched along with the cover stock out the back door. It must have been late winter of the new year when John Scott arrived, unannounced, at the door of the apartment on Broadway; we piled into his car and headed out to East Cleveland. Whose idea was this? We found levy standing just inside the door of his apartment where he had, in fact, just taken down the security chain and opened it up to John's trademark knock. He blinked away the last remnants of sleep, looking — almost — as if he didn't know who we were, retired to the bedroom, dressed, and accompanied us out of the building into the car at the curb. The rush hour traffic down Chester had long dissipated; a raw, overcast morning such as the city is likely to experience in any year up to late April. levy, who had been for the most part silent, suddenly lit into a round of abusive language kept up non-stop for the next thirty blocks, furiously lashing out without meeting our eyes or suggesting to whom he was directing the stream of invective. In how many ways could a certain epithet be compressed into a string of continuous sentences and still be intelligible — he found them. r.j., seated beside him, clenched the arm rest and attempted a stare out the windshield. John struggled somewhat to hold a bemused expression as he negotiated the wheel, peering at times into the mirror to solicitously check on the one-sided argument behind him. I hoped all this wasn't over the possibility that we had gotten him up out of bed. 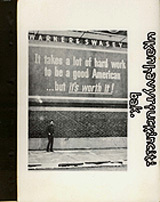 With hints of rubber burning the car pulled up at East 55th and Carnegie abreast of the enormous billboard on the brick wall of the Warner & Swasey Company; John leapt out with the camera and went around quickly to the passenger side in the rear. He opened the door for levy, who remained seated, still hyperventilating. For a moment it seemed that levy would have to be pulled screaming out of the car. Fortunately, trembling with anger, levy got out and walked to just under the billboard where the harried photographer took several steps backwards and squinted into the viewfinder: a single — forgive me — shot of a man who was keeping his mouth shut and didn't much care for it. The next time I saw him he was volubly pleasant and perhaps a bit apologetic without having to resort to the actual words. If I remember correctly — and I do — he was literally hopping around, unable to contain his excitement over what, after all, was only a book.